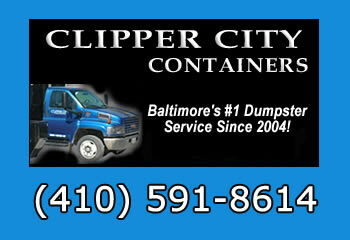 At Clipper City Containers we offer local dumpsters for rent in the Baltimore metro area. We are a local, family-owned business dedicated to providing superior service at affordable prices. Our goal is to ensure you have a hassle-free experience when you rent a dumpster. We offer 12, 17, 20, and 30 yard roll off dumpsters, so no matter what your current project is we have the correct dumpster size. Our waste dumpsters are an affordable choice for homeowners, contractors, or business owners that need a temporary dumpster on site. View our dumpster tips below for more information about dumpster rental. At Clipper City we believe in prompt, professional dumpster service at affordable prices. If you need to rent a dumpster or would like to learn more about the dumpster rental process, please call us today for a positive, hassle-free experience. Our customer service is friendly, knowledgeable and will help you determine the correct dumpster size for your next project. Whether you’re a homeowner renting a dumpster for the first time or a contractor who rents multiple construction dumpsters in Baltimore every month, we make the same commitment to you – we’ll deliver your dumpster on time, pick it up promptly upon request, and do it all at the best dumpster prices in Baltimore. Baltimore’s #1 Dumpster Service since 2004! Household junk, bulk trash removal, mattresses, carpeting, construction debris, scrap wood, sheds, play sets, old appliances (with Freon add $25), outdoor furniture and more. Work faster and smarter with a dumpster rental from Clipper City Containers.